When I talked by phone with Jailton “Dendê” Macedo, director, dancer, and drummer with the traditional Afro-Brazilian musical ensemble Ologundê, before the group opened CTMD’s Heritage Sunday performances at Lincoln Center in August, one of the first questions I asked him was where he got his nickname. As it happened, the sobriquet was given to him by a musical mentor, Carlinhos Brown. Brown founded the renowned Afro-Brazilian band Timbalada, in Salvador da Bahia, the capital city of the state of Bahia, in northeastern Brazil. Receiving a nickname from one’s musical role model, a name which later becomes one’s professional name, is a traditional form of honor for musicians in Brazil, Dendê confirmed. Honorific nicknaming is practiced in a variety of other Afro-Latin and African-Caribbean musical traditions as well. Jailton’s new name symbolized a rite of passage—an exceptionally talented and hardworking young musician’s emergence into a new way of life: the beginning of a long career as a professional Afro-Brazilian roots musician—as Dendê Macedo. Dendê is a key ingredient in Bahian home cooking, and serves as a seasoning in the dishes prepared for Afro-Brazilian religious celebrations honoring the orixas (west African deities). The word “Dendê” also shows up frequently in capoeira songs. Capoeira is an Afro-Brazilian form of music and acrobatics accompanied by drums (the pandeiro or hand frame drum, and the conga-like atabaque) and the berimbau (a stringed instrument resembling a fishing rod, consisting of a pole with gourd and steel string, sounded with a stick). Performed in a circle, with call-and-response singing, the dance traces its origins to the 16th century, when it is thought to have been developed by African slaves on Brazilian sugar cane plantations. Practiced for centuries afterward as a form of martial arts training despite government prohibitions, capoeiraproved useful in actual combat (Brazil’s war with Paraguay in 1864) and also for the purposes of self-defense, exercise, and recreation, as is the case today. Capoeira and samba da roda(pronounced “samba gee-hawda,” an older form of samba performed, like capoeira, in the round, the roda) are just two of a variety of traditional music and dance forms that Dendê performs with the members of Ologundê and with several other groups he directs (the Afro-Brazilian band Hahahaes, the samba group Samba de Três, and his Brazilian percussion ensemble Arrastão de Dendê). Ologundê’s 8-15 members reside in New York City as well as Brazil. 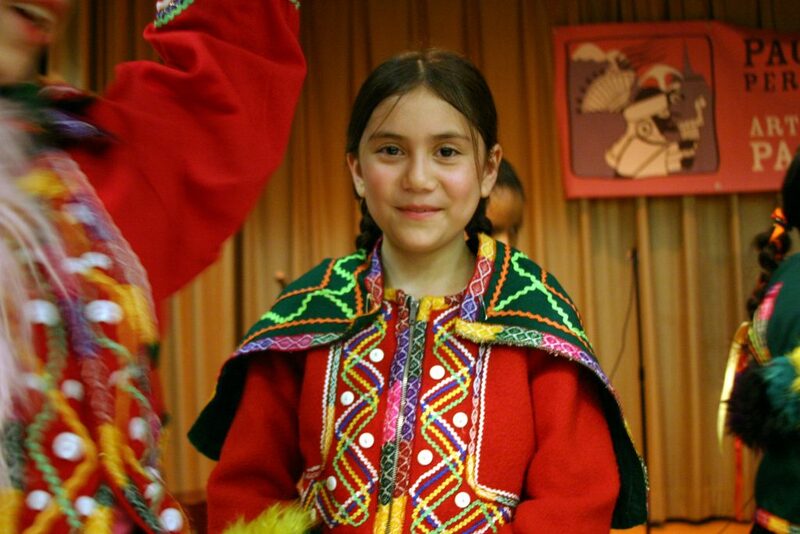 Dendê emigrated to the U.S. in 2001 and now lives in New York most of the year. He returns annually to Bahia, facilitating tours for fellow musicians and friends, and to visit his own relatives, as well as his family in Candomblé, the members of his spiritual house. Their commitment to each other, like the commitment between immediate family members, is expected to last a lifetime. Like Haitian Vodun and Cuban Santería, Brazilian Candomblé is a religion evolved by African slaves, who synthesized west African orixa worship—including its music and dance forms–with some of the iconography of Catholicism, in order to protect and continue the traditional African spiritual practices unbeknownst to Christian slavemasters. In the tight-knit and extensive social network in Salvador da Bahia, where he was born in 1977, Dendê found many musical role models. He was raised by parents who appreciated music of all kinds—secular and religious, folk and pop. From his father he learned to appreciate Cuban and Puerto Rican music and to love merengue, fusion styles, the best African djembe players, and the music of Tito Puente. Throughout the family there was a strong spiritual heritage, as well, with aunts, uncles, his mother, his sister, and his grandmother keeping up the old religion, attending different spiritual houses in Bahia, and keeping up the old customs at home. He can’t remember when he first heard the drumming and music of Candomblé or Samba da roda, he says. These older musical forms were just part of everyday life. They were everywhere in Salvador da Bahia, whether he was visiting family and friends, other spiritual houses, or just hanging out in the street, as a kid. He would listen to, and eventually imitate, the best of the oldest musicians accompanying these dance forms, something he continues to strive to do on stage today, here in New York, and around the world. By age eight, Dendê said, he would make short excursions out of his parents’ home to visit some of the spiritual houses in Bahia, eating the food they would cook for any visitors and for ceremonies, watching the drumming and dancing through the window, until he was invited in. After a while, people saw, even as a child, that he was serious, and stopped telling him, “You’re too little, you’re too little.” He began with the hand percussion, the bells known as the agogo. The agogo play continuous repetitive rhythmic lines alongside the layered rhythms of the three sacred drums at Candomblé ceremonies. In this sense the bells are akin to the claves (sticks) or campana (cowbell), which play simple but steady and continuous rhythm alongside the three sacred drums (batá) played at the spiritual dance and drumming sessions in Santería. Once Dendê had mastered the agogo to his elders’ satisfaction, he graduated to the drums of Candomblé, progressing from easiest to hardest. He began with the third (rumpilé or lé for short), moved to the second drum (the pi or rumpi), and finally mastered the first drum, which plays the most complex rhythms—the variations: the rum. He would listen for a long time, visiting again and again. Then he would practice at home, practice until he felt confident, and return to the older musicians for their approval. He would play with them to their satisfaction before trying to move on to the next instrument. In this way, by age 12, he was permitted to play for Candomblé ceremonies. By 13, Dendê had started his own “kids” version of the samba da roda circle dance group. 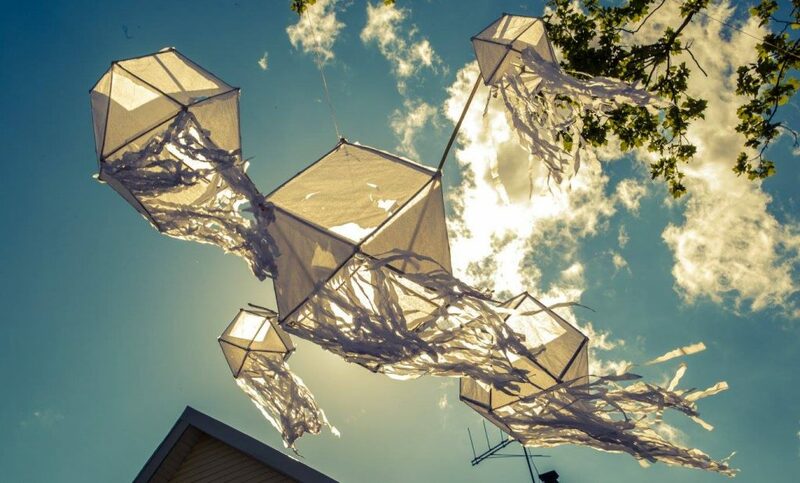 This attracted much positive attention in his neighborhood. By 14, Dendê was drumming professionally, invited to play at festivals and to lead a variety of bands from different neighborhoods in Bahia. Shortly thereafter his brother-in-law Mauricio introduced him to Carlinhos Brown, who accepted him into Timbalada. This launched his professional career fully and established him as a recording artist as well. 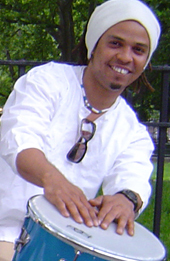 Drumming with Timbalada, Dendê toured through Brazil, Asia, and Europe, producing an array of CDs, and appearing on television programs. The roster of leading Brazilian, jazz, and world musicians with whom he has performed so far is impressive, including Marisa Monte, Gilberto Gil, Yvette Sangalo, Sepultura, Giovanni Hidalgo, Vinicius Cantuaria, and Zakir Hussain. For Dendê, music is a spiritual calling, as well as a lifelong source of energy and enjoyment–which he strives to share with his audiences today. “When I play, the Spirit is strong, really strong.” Dendê explains that he has faith in the three orixas who guide him in his life, and in his playing: Ogum, the warrior; Oxossi, the hunter; and Obaluaye, the deity of healing. His own personal practice and hard work have played a role in his success as well, he admits. Discipline is really important, Dendê points out, as is continued exposure to new people and new ideas. By performing in the Walker Stage series on Walker Street in lower Manhattan, for example, Dendê met and played with many of New York’s best jazz and world musicians. The series culminated in a performance at Bahia’s Mercado Cultural, by the jazz ensemble Speak in Tones, led by Daniel Moreno and Mike Ellis, featuring Cheikh Tidiane Seck, Graham Haynes, Adam Rudoph, and many others. His work with these fine musicians and his lifelong immersion in Afro-Brazilian traditional music and dance have provided the rich musical inheritance he shares with his students. Thus, Dendê’s career has been a series of opportunities to teach and to learn, from the variety of artists and friends who have appeared along the winding path that has been his musical life. To book Dendê in performance with Ologundê, contact Kaisha Johnson, CTMD’s Director of Artist Management, at 212-571-1555, ext. 23 or kjohnson@ctmd.org. Eileen Condon, Ph.D., was Project Director for the Ukrainian Wave Community Cultural Initiative, the Chinese Community Cultural Initiative and Verite Sou Tanbou: the Haitian Community Cultural Initiative.